Did Elliot’s Cat Really Do That? 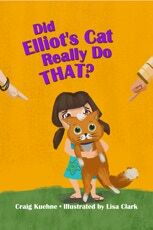 I am very happy to announce that I have just finished my first children’s book, Did Elliot’s Cat Really Do That? With rhyming text that’s fun to read for both adults and children, Did Elliot’s Cat Really Do That? explores the consequences of not telling the truth. Beautifully illustrated by Lisa Clark. The print version is available through Lulu.com, Amazon, and Barnes & Noble. Click on each of the logos below to take you to their respective stores. A special interactive version is available through Apple’s iBooks Store.